The tree is up, the lights are strung and the stockings are all hanging on the mantle. The only thing left to do is to start dropping hints to my the family about what I really want and don’t want under the tree this year! Don’t get me wrong, I love getting a new pair of stretchy pants every December 25th, but what I really want is something I could USE in the shop vs WEAR in the shop! 1. Set of 5 Lie-Nielsen Bevel Edge Socket Chisels with Tool Roll – every woodworker knows the value of a good chisel, imagine the value of an entire set of these high quality Lie-Nielsen Bevel Edge Socket Chisels? I know my family will say I already have a set of chisels but while they work fine like a good commuter car, who doesn’t want to drive a classy luxury vehicle? That’s what the Lie-Nielsen chisels truly are. 2. 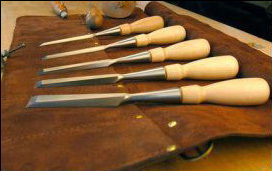 Bowclamp Clamping Cauls – we’ve all heard the old adage “You can never have too many clamps” but I think just as equally important is knowing what a tool like a clamping caul can do to make the few clamps you already have, work like they never have before. If you’ve never used a caul before they are an amazing shop accessory that incrementally increases the clamping reach and power of an ordinary clamp. Where an ordinary clamp may only reach a few inches across the length of a wide glue up, a caul will apply pressure across the entire length of its body. It’s an amazingly simple tool that does an equally amazing job! 3. Kreg Precision Miter Gauge System – I have a feeling I’m not alone when I say the standard miter gauge on my table saw is “just ok”. It works well for what it does, it’s easy to setup and use, but it always has me concerned it’s about to fail me when I need it most. 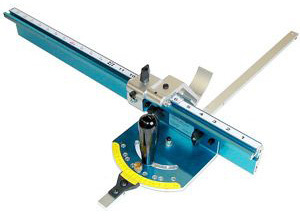 That’s why I would really love to see a Kreg Precision Miter Gauge System under the tree this year! “The CNC machined gauge head with an easy-to-read Vernier” means I don’t have to second guess the angled cuts I’m trying to set up. And the long 24″ Heavy Duty Aluminum Trak and Kreg Swing Stop means not only is my stock being supported through the cut, but I can easily setup a stop that makes repeatable cuts as accurate as ever. 4. Festool DF 500 Q Domino Joiner Set w/Cross Stops – Last thing on the list of the perfect Christmas morning would have to be the Festool DF 500 Q Domino Joiner Set. This tool would probably get used so much in my shop I might end up wearing the paint off the body! Festool makes amazing tools and the Domino is no exception. It’s a great tool that belongs in my shop. Lie Nielsen No. 51 Shoot Board Plane OR a Lie Nielsen Iron Miter Plane – who doesn’t want to have better results on a shooting board? 8″ Forrest Dado-King set – because the Forrest Dado-King has given me the best dado cuts EVER but my new SawStop saw won’t work with my 6″ stack. Regardless of what ends up under the Christmas tree, or in my stocking this year, I’ll be very grateful for just being together as a family. But if a Christmas Miracle were to happen in the Vanderlist household that involves wish lists being fulfilled, mine is all set. Did you know you can create a wishlist at Highlandwoodworking.com and send it out by email to anyone who might be searching for the perfect gift for you? CLICK HERE to get started with your own wish list. Great Woodworking Gifts: Woodworking Books from Fox Chapel – 33%-50% off Take a look at the December issue of Wood News Online!